During a long cold winter we all, of course, rely on our heating system to keep us warm and comfortable. So, if during those colder months, your heating system should malfunction for any reason, you’re going to want to get it fixed straight away. But before you call a contractor, there are a few questions you might want to ask yourself first. Because by implementing one-or-two simple, precautionary measures, you might find there’s no need to call someone out after all, saving you both time and money in the long run. Now, this might sound obvious, but you’d be surprised. So, before contacting a commercial heating contractor, check your fuses to make sure a new fuse, or a simple flip of the breaker, isn’t enough to get you back up and running. Often, it really is a simple as that, and whatever the problem might end up being, this should always be your first, investigative action. Is There a Separate Heating Switch or Reset Button? Again, it might sound pretty straightforward, but, you never know, this might just do it. So, before attempting anything else, you’d do well to check: is there a separate heating switch? If there is, it might be as simple as turning it on to see if your heating system kicks back in again. Similarly, there might be a reset button you can try. You might want to give it a few minutes after pressing it, but, if you’re lucky, it’ll do the trick. How Are Your Fuel Levels? If you have access to your metre, you’ll definitely want to check that. Also, if your fuel is stored locally (perhaps in a tank) you might also want to check the levels before calling a commercial heating contractor. It’s also a good idea to check to see if the pilot light is on. Is Your Thermostat At The Right Setting? Another thing to look at before picking up the phone is whether or not your thermostat is at the correct setting. Because, often, turning it up by just a few degrees can reboot your heating system and get it working again. Then, if the heat does come back on, be sure to reset the thermostat to where it was previously, and you’re done. Easy as that. If None Of This Works? If you’ve tried all of the above with no success, then it probably really is time to call in a professional to help get your heating system back online. 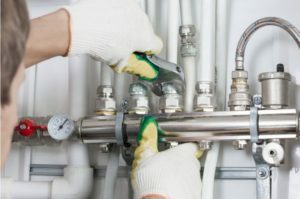 And, if you’re based in Manchester or anywhere in the North West, ST Heating Services Limited provide a cutting-edge service at prices that cannot be beaten elsewhere. They have a long and proud history of servicing boilers and heating systems in both the private and commercial sector. In effect, theirs is a quick and efficient approach that’s kept their customer base warm in winter, year in year out, no matter how big the problem.